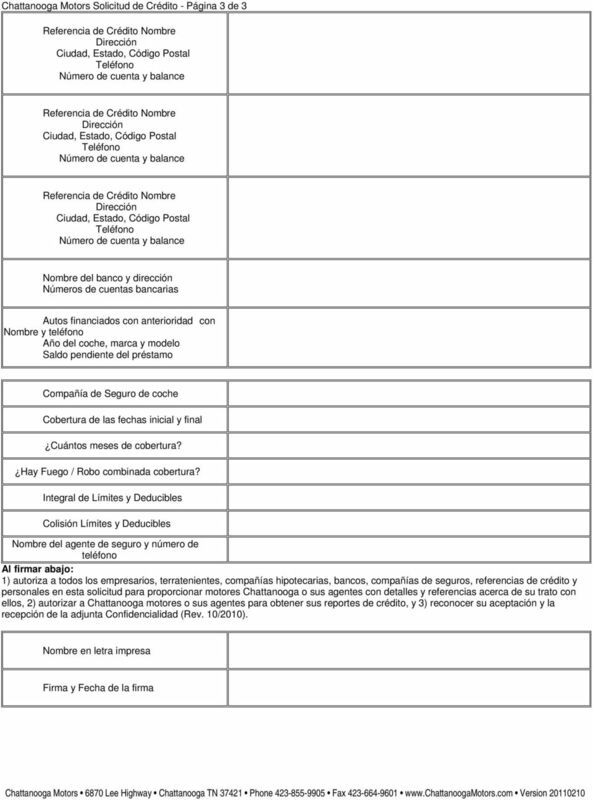 Download "Chattanooga Motors - Solicitud de Credito"
1 Chattanooga Motors - Solicitud de Credito Completa o llena la solicitud y regresala en persona o por fax. sotros mantenemos tus datos en confidencialidad. Completar una aplicacion para el comprador y otra para el aval. Cómo se enteró de Motores Chattanooga? 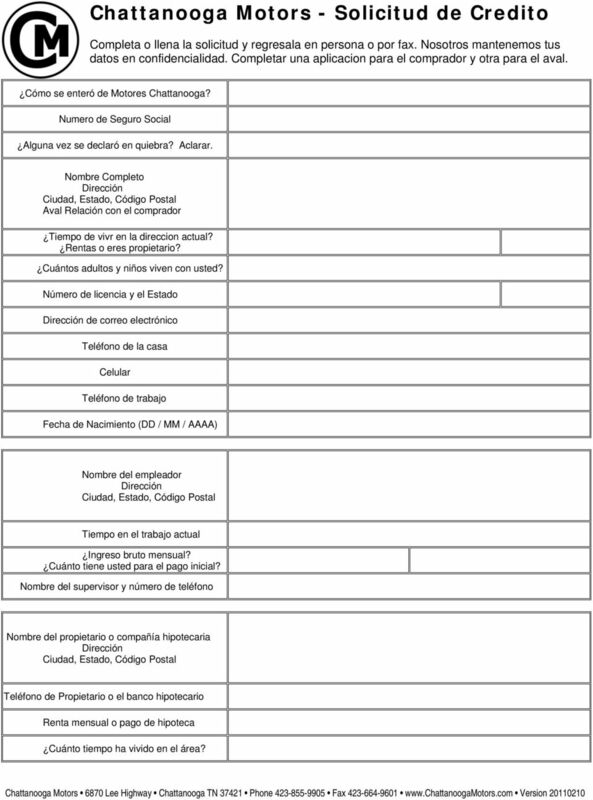 Numero de Seguro Social Alguna vez se declaró en quiebra? Aclarar. 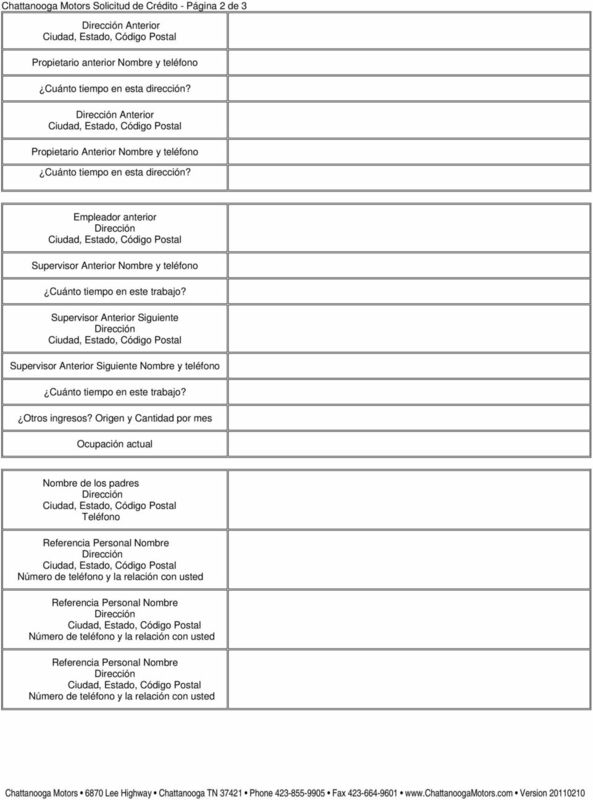 mbre Completo Aval Relación con el comprador Tiempo de vivr en la direccion actual? Rentas o eres propietario? Cuántos adultos y niños viven con usted? Número de licencia y el Estado de correo electrónico de la casa Celular de trabajo Fecha de Nacimiento (DD / MM / AAAA) mbre del empleador Tiempo en el trabajo actual Ingreso bruto mensual? Cuánto tiene usted para el pago inicial? mbre del supervisor y número de teléfono mbre del propietario o compañía hipotecaria de Propietario o el banco hipotecario Renta mensual o pago de hipoteca Cuánto tiempo ha vivido en el área? 4 Rev. 10/2010 FACTS Why? What? How? WHAT DO Chattanooga Motors LLC and LoanSpot LLC DO WITH YOUR PERSONAL INFORMATION? Financial companies choose how they share your personal information. Federal law gives consumers the right to limit some but not all sharing. Federal law also requires us to tell you how we collect, share, and protect your personal information. Please read this notice carefully to understand what we do. The types of personal information we collect and share depend on the product or service you have with us. This information can include: Social Security number and income account balances and payment history credit history and employment information When you are no longer our customer, we continue to share your information as described in this notice. All financial companies need to share customers' personal information to run their everyday business. 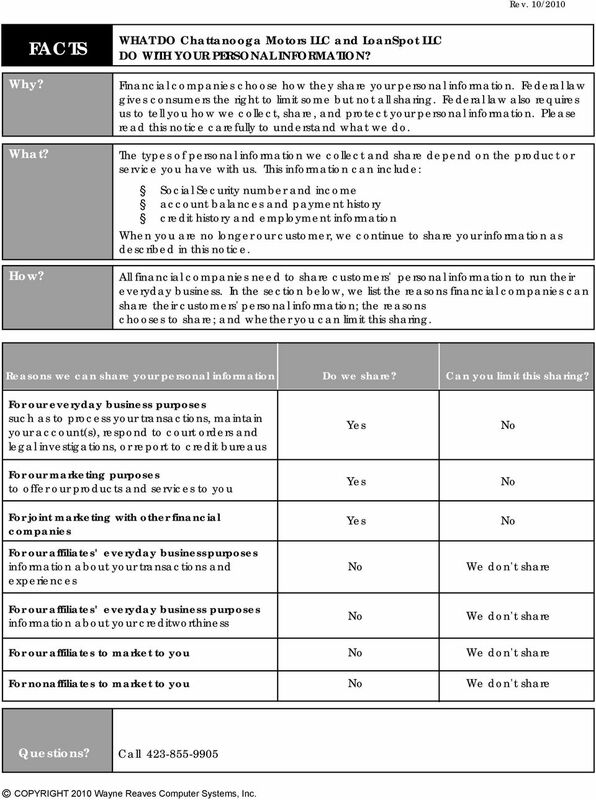 In the section below, we list the reasons financial companies can share their customers' personal information; the reasons chooses to share; and whether you can limit this sharing. 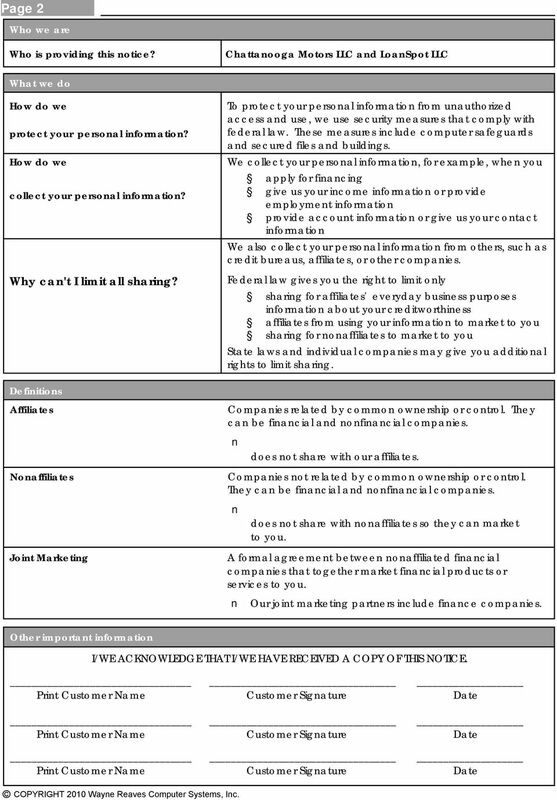 Reasons we can share your personal information Do we share? Can you limit this sharing? For our everyday business purposes such as to process your transactions, maintain your account(s), respond to court orders and legal investigations, or report to credit bureaus For our marketing purposes to offer our products and services to you For joint marketing with other financial companies For our affiliates' everyday business purposes information about your transactions and experiences For our affiliates' everyday business purposes information about your creditworthiness We don't share We don't share For our affiliates to market to you We don't share For nonaffiliates to market to you We don't share Questions? Call COPYRIGHT 2010 Wayne Reaves Computer Systems, Inc.
5 Page 2 Who we are Who is providing this notice? Chattanooga Motors LLC and LoanSpot LLC What we do How do we protect your personal information? How do we collect your personal information? Why can't I limit all sharing? Definitions Affiliates naffiliates Joint Marketing To protect your personal information from unauthorized access and use, we use security measures that comply with federal law. These measures include computer safeguards and secured files and buildings. We collect your personal information, for example, when you apply for financing give us your income information or provide employment information provide account information or give us your contact information We also collect your personal information from others, such as credit bureaus, affiliates, or other companies. Federal law gives you the right to limit only sharing for affiliates' everyday business purposes information about your creditworthiness affiliates from using your information to market to you sharing for nonaffiliates to market to you State laws and individual companies may give you additional rights to limit sharing. Companies related by common ownership or control. They can be financial and nonfinancial companies. does not share with our affiliates. Companies not related by common ownership or control. They can be financial and nonfinancial companies. does not share with nonaffiliates so they can market to you. A formal agreement between nonaffiliated financial companies that together market financial products or services to you. Our joint marketing partners include finance companies. Other important information I/WE ACKNOWLEDGE THAT I/WE HAVE RECEIVED A COPY OF THIS NOTICE. COPYRIGHT 2010 Wayne Reaves Computer Systems, Inc.
WHAT DOES WELLS FARGO DO WITH YOUR PERSONAL INFORMATION? Aquí estás en el área de Bill Pay. Nehemías Toro Insurance Agent. Presenta/Presents: First Medical Health Plan Inc. Please note that we are going to process your application in our agency labor hours: Monday through Friday from 8:30 AM to 5:00 PM, except holydays. ***REMINDER: Scan & add to Applicant Flow Log. *** Aplicación para el empleo An Affirmative Action/Equal Opportunity Employer Gracias por considerar Cape Romain Contractors, Inc. como un empleador de usted.